After a two-year absence, the Woodburn firefighters regained their title as Chili Chiefs last month after winning the Judge's Choice award at the annual Woodburn Chili Cookoff fundraiser. 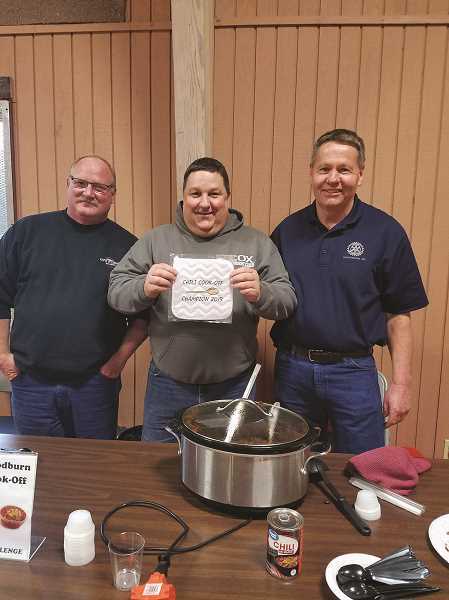 The Chili Bandits — comprised of local firefighters Jay Hannon, Paul Iverson and Bill Klein — won the honors over four other entires at the fourth annual cookoff on Jan. 26, which helped raise $1,592 for the AWARE Food Bank and Love INC of North Marion County. The firefighters won the inaugural event in 2015, but representatives from the Woodburn Police Department took the honors in each of the past two years until the Chili Bandits dethroned them with their "South of the Border" entry that featured barbecue tri-tips and sprinkled chocolate. Representing the Woodburn Kiwanis Club, Gina Audritsh won the People's Choice awards — given to the entry that garners the most donations — for her "Tailgate Chili" entry. The judges were Woodburn Mayor Eric Swenson, Woodburn City Councilor Eric Morris, Woodburn City Administrator Scott Derickson, and Steve Kufeldt, pastor of the host church. Record crowds attended this year's cookoff, which was sponsored by the French Prairie Kiwanis Club and was hosted by Hoodview Church of God in Woodburn. The event was underwritten by the generous support of Legacy Financial, Abby's Pizza, Hallmark Properties and Brown Insurance. To date, the cookoff has raised more than $6,000 for local charities.